We talked with Rober Koptas, the Chief Editor of Agos, about what the newspaper transformed in Turkey, the adventure of its progress after Hrant Dink and points to which Turkey reaches in taboo questions in the last six years. According to Koptas; even if “it knocks its head against a brick wall”, the newspaper, which has great contributions in making those questions talkable in Turkey, reminds what system causes to forget and tries to create a new language for making those questions understandable by more people. Could you mention your story about how you met with Agos? Were you aware of this initiative before it was published? What did you feel when you first held it in your hands? I was informed about the newspaper before it was published. I was working part-time in Aras Publishing at those times. The graphic designer Vartan Paçacı and Brother Hrant made one of those meetings in the Office of Aras. Vartan Paçacı shared graphic drafts of Agos which he drew-up, with Brother Hrant. Brother Hrant also asked me “Which one is beautiful? Which one is better? There were some designs with blue logo, I did not like them. I smart mouth them and said “The blue one is like a tourism guide. The re done is more like a newspaper.” Then when the newspaper was first published, I was happy when I saw it was red and I took the credit for this. I remembered that I was very excited. I remembered that I thought as “At last, we have a newspaper which I could read in ship, train and which I could open without any fear because it is Turkish”. Did you know each other with Hrant Dink before? We met firstly at that time. We did not have any intense cooperation. I made a presentation in the conference in Bilgi University in 2005. He took me aside and said “I follow what you did. You make good things”. And I was very proud. He called us, the team of Aras Publishing, for a conversation in May 2006. He said that he made the book called “Armenians in Ottoman Empire”, which is now published by Aras, translated and wanted to publish but he did not prefer to do so because of the pressure on him. And he gave the book to us. I saw Brother Hrant very nervous and exhausted at that meeting. The weight of the pressure on him could be felt. As far as I met, he was vivacious and lively. That time, he was not like that. This made me sad, shocked me. I thought “How could I support him?” I said “Let’s write in Agos” to myself. I request an appointment from him and he gave me that appointment. I went and told. And he immediately said: “Ok. Let’s start from this week but do not delay or make a limp then”. I started to write in Agos in every week in the last days of August 2006. He was murdered 5-6 months after that. How a point did the generality of Turkey and Armenian society placed before Agos according to your observations? Before Agos was published, Armenians lived introvertedly and conservatively. There was a structure in which the Patriarchate was in the centre, two newspapers stated the Agenda, people came together by means of some cultural activities but the voice of the community could not heard in any way, the community lives as does not exist, but in which there were some officers and authorized people who was called from the state when they are needed. But Turkey was changing. Accordingly the structure of the Armenian society is not so sustainable. Agos is the result of this. When we look for Turkey, before and after Agos, it is like black and white, especially in the context of Armenian question. Today, of course we could not reach to the ideal point. But when we compare with the situation before 20-30 years, there are so many people who are aware of the fact that who Armenians are in Turkey, what sort of problems they are faced with and what happened in the past and who study on this point. If Agos does not exist, those were lesser, if brother Hrant does not exist, those were the least. Agos, worked nearly like a non-governmental organization, even sometimes like a university assembly. An in this sense, it became one of the most important centres of an intellectual transformation. If there is a ground in Turkey where we could breathe, talk and communicate, of course Agos and Hrant Dink has an important role here. How were reactions when Agos was first published? There were two different types of reaction in Armenians: the predominant one was a huge support and excitement. People, whom we could say commons/populace embraced. There was another reaction in Armenians given by a little segment as coming out against and refusing. There were some people who thought that it was a revilement to Armenian culture since it was published in Turkish. Beyond this, there were some others who protested Agos since it disturbs their position in their own relationship based on self-interest. Because Agos never be hypocritical for not to want this democratization and transparency for Armenians, which it desires for Turkey. How is it perceived in Diaspora? It a newspaper which was followed closely by people who immigrated from Turkey in the recent past. It does not mean so many things for generations who immigrated many years before and who forgot Turkish. There is such a segment for which Agos is the most important mean for receiving news about the hometown and being fed by the hometown. The personality of Hrant Dink has a direct affect on the way of existence of Agos, hasn’t it? I think it is 100%. May be at the beginning it was imperceptible, but after a while, when Hrant Dink assumed the job on his own, he started to manage the newspaper with his own personality and spirit. He dominated and directed his newspaper by means of what he saw up to day, his intellectual knowledge and his intuitions at most, in my opinion and he was not wrong so much actually. He did this by coming out the society more. In fact, he both strengthened his own personality and he formed Agos by this way. Hrant Dink believed that it is required to negotiate the ignorance and unawareness as calling out to consciences in order to open the path for Turkey to face with 1915. I guess Agos maintains this mission today. Above all, it is about to know the system which you face with. We know how the system indoctrinates people. We know with which books students are taught in schools by National Education system. Under these circumstances, we think that it doesn’t make sense to blame people or society. Here it makes sense to ensure the transformation which could change the system. Of course we are aware of the fact that this won’t be easy and this could only ensured by a long range challenge. It is required both to give information in other words to remind people what they forgot and to call them to the conscience. It exists that there is a goal to surprise people with an Armenian approach and presence that is not nationalist and rough and to go beyond the ordinary. I do not know what was talked or discussed about this before 19th January but before the “genocide” was not a common word used in the newspaper, it was used very rarely, when others quoted, I don’t remember any other. After 19th January, there was no serious discussion or debate about this issue, some authors used this, and some others only quoted in news. Both Hrant Dink and Agos have no doubt that is genocide. But on the other hand, it is not so important for us that this is not determined as genocide. It matters for us that this must be perceived, understood, known by Turkey society and must be condemned in the consciences of people. For example, I used this word especially in my columns. Of course this was the result of anger. It was like “If they take the one who is the most peaceful one among us, it doesn’t make sense to be peaceful”. But recently, to create a language which shall help people who read to understand something is important for me. May be Brother Hrant looked for this during his entire life; his Agos adventure was passing with looking for that language, that style. He could create naturally by means of his personal characteristic. 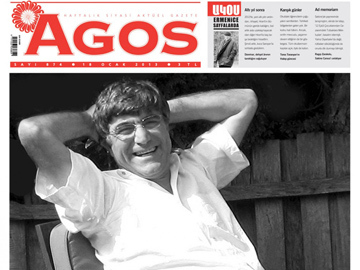 Today Agos becomes a newspaper as Hrant Dink dreamed of, became a more professional newspaper. It is definitely more corporate, but not more professional. Subjects became diversified; the number of pages increased and this required a serious organization. Beforehand, it maintained as a family newspaper, more. It became more corporate, but it has amateur spirit. It has a desire to be Professional. This is for standing and bearing more strongly and to be carried to the future, never to gain any profit. The diversity of subjects increased. We do not have interest and concern on every issue not only on Armenian question. We try to mention developments in the World as much as we can. Do you have any study on reader profile? I could not give exact data but approximately 5000 Agos are sold. Nearly 500 of those 5000 are subscribers from abroad. Nearly half of the readers are Armenians. Those who are not Armenians gradually increase. Our distribution network is not very wide but we go to some other cities. For example we go to two bookstores in Diyarbakır. In what point do you see Turkey when you look at the last 6 years passed? One segment of the society knew Hrant Dink with his murder and Armenian quest dominated its several dimensions by means of his death. It became information which obtained roots that some injustices, discriminations are a part of lives of Armenians, non-Muslims in Turkey according to a wide range segment of the society. In other words; people received the information of “A skilled Armenian journalist was murdered.” Such questions and answers that “Why this is happened? Why was this man murdered? Because he is an Armenian” probably influenced people deeply. There haven’t been such many people walking in commemoration of anyone after 6 years from the murder until today. The murder of Hrant Dink is on a critical point for cleaning the Government. The desire for a government that does not commit an illegal act and does not carry out such operations requires demanding justice in this case. Of course there are some people who think that he was murdered because he deserved it by the point of nationalist and racist view but I believe that those are in the minority. Where we are or not in 6 years concerning facing with 1915 or relationships with Armenia? I think we are in a better point for all these subjects. It is obvious and undoubtful that we progress in terms of the preparation of society and public. But all of those are waiting as problems to be solved. In other words, we are passing through a process in which the challenge continues the social ground expands and the civil area expands but since the government does not change its attitude generally, since school books are not changes and official propaganda is continuously regenerated; we could not cover a distance. Although daily tides drive us to desperation, when I look over the long run, each time I can see that Turkey society changes for the better. I think like that because I know Turkey, the government. Even if hardly or by brutal force; it created a society for itself and placed some opinions in it and it is not so easy to change those opinions. Unfortunately, Armenians throughout the World and Armenia have no patience to wait. I could understand them so much. They are already suffering from a pain in their hearts for 98 years. The refusal is added and it enlarges the anger. The rhythm of them and the rhythm of Turkey in this sense are very different from each other. But the truth is that what is decisive shall be the rhythm of Turkey. In Turkey, the attitude in some issues could be changed immediately when the government decides. Shall it be optimism to expect such a thing in this issue? May be this could be happened about relationships with Armenia, the international conjuncture could require this. We could pass to a period when the border is opened and the relationship starts immediately. It shall be salutary and advantageous. But with the approval of genocide, I don’t think there shall be an intense external pressure. Turkey is always an ally which is very important and required not to be lost in the last instance. It is the last example of that the French Constitutional Court refused the Law on Armenian Genocide Denial. I don’t think that attitude shall change more. But, I don’t think that this shall be “knocking our heads against a brick wall”. I do not think this shall never be approved. May be Turkey will never approve the genocide. But it is the witness of an important stage that this is being talked in the society, and more people are aware of this issue and it is written or drawn independently and freely today. If that stage shall bring the social approval in the future, the policy/politics shall be obliged to approve it. Especially if the international conjuncture will coincide, approval shall be inevitable.